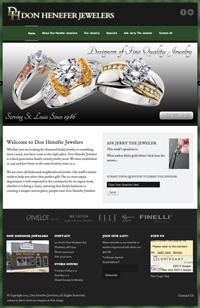 Don Henefer Jewelers has been selling, creating and repairing fine jewelry from Florissant, Missouri since 1946! For their website we selected a dark, sophisticated color scheme with dark greens and black and a stunning front page slider with multiple animations. The logo design is a Blue’s ArtHouse original.